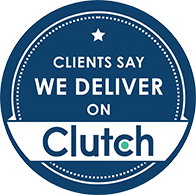 We‘re registered on clutch.co, which allows our clients to be independently interviewed to provide reviews on the work work we have done for them. View our clutch profile. Clutch also ranked us as a top UX Design agency in their industry ranking. Every Interaction are a top-100 London UX Design Agency. Our team are experts in digital product design, interface design and making your interactive things not just usable, but a joy to use.